This little corner has been quiet for days - my heart occupied with other things. It's focus my precious husband - praying fervently for him. I could hardly think of another thing - just asking the Lord for healing in that one, fragile eye. Begging to touch the hem of His garment, to gather the crumbs from the table. In the process, (and it's always a process for me) I've walked with Him through valleys and soared over mountains. I've rested in faith and cried tears of doubt and fear. Truths I thought sealed tightly in my heart sometimes felt out of reach. I walked familiar paths and sometimes lost my way. I didn't get the the gift I prayed for - wrapped in my own wisdom and understanding. He gave me His gift - wrapped in love and grace. I'll write about it soon. On this morning, with sunshine peeking through the clouds, I simply long to be like that sweet little baby in the picture. 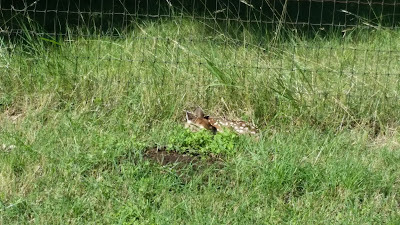 We saw her sleeping there in the tall grass yesterday. Sleeping - out in the big, wide, scary world; trusting her Mama would be back soon to get her. Knowing it would be all right. Praying for your husband and you! Thank you for your words... much needed! So sorry, Linda. Will remember you both.